“The object is not to produce a lot of oxygen. The object is to show that the process works on Mars. MOXIE produces only about 10 per hour of oxygen, less than one percent of full scale,” Rapp said. 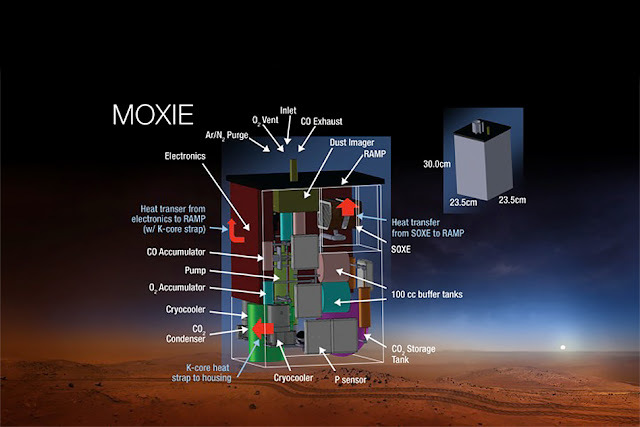 Martian atmosphere is 96 percent carbon dioxide and MOXIE will work just like a tree - inhaling carbon dioxide and exhaling oxygen. It will collect carbon dioxide from the atmosphere, compress and store it, then it will electrochemically split the carbon dioxide molecules into dioxygen and carbon monoxide. 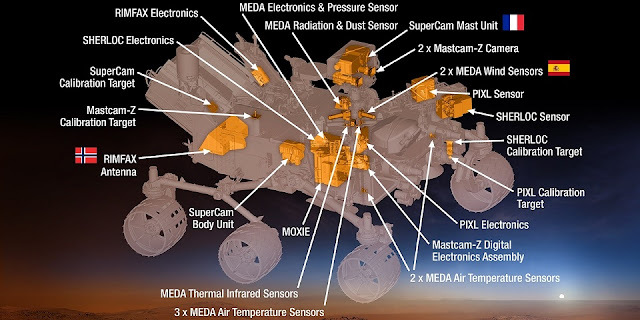 The dioxygen will be then analyzed for purity before being vented back out to the Mars atmosphere along with the carbon monoxide and other exhaust products. MOXIE will consume up to 300 W of power and will operate at 800 degrees Celsius, requiring a sophisticated thermal isolation system, including input gas preheating and exhaust gas cooling. The instrument’s design includes technology to investigate dioxygen exhaust and carbon dioxide/carbon monoxide exhaust streams, that will be analyzed to verify the oxygen production rate and purity. However, if MOXIE successfully completes its task, a future full-scale instrument will need to consume more resources to work properly. “If MOXIE works well, scale-up is feasible. However, scaled up version will require considerable power,” Rapp noted. A full-scale MOXIE-like instrument could be employed to produce oxygen on a larger scale, mainly for life-sustaining activities for humans. The system could also deliver liquid oxygen needed to burn rocket fuel for a return trip to Earth. Moreover, the carbon monoxide that will be also produced by the instrument may be utilized directly as fuel or converted to methane for use as propellant. Meanwhile, MOXIE is in its early stages of development. The instrument has recently passed the Preliminary Design Review. “The instrument passed Preliminary Design Review favorably and is scheduled for Critical Design Review in about six months. After that, we proceed to build and test the flight model,” Rapp revealed. Mars 2020 mission is expected to deliver important information about the potential habitability of the Red Planet. Besides testing method for producing oxygen from the atmosphere, the rover is designed to identify other resources such as water, improve landing techniques, and characterize weather, dust, and other potential environmental conditions that could affect future astronauts on Mars. The mission, managed by NASA's Jet Propulsion Laboratory in Pasadena, California, is currently slated to be launched in July 2020, atop an Atlas V booster, from Cape Canaveral Air Force Station in Florida.